Welcome to "At the Organ"! New Extrait Fragrance Giveaway Draw. I have been itching to start a blog covering the creative process at Fitzgerald and Guislain for quite some time, and Ian and I have finally found the time to get one up and running! This blog will give you an in-depth look at how we make perfume: not just our ingredients or our blending theory, but the entire creative and manufacturing process: from gathering field notes to our unique perfume aging system. We will occasionally cover perfume history (anyone who has taken our "Perfumers of the Gilded Age" course already knows about our unhealthy perfume history obsession.) We will also cover upcoming company events, our plein air misadventures, and of course: new perfume launches (and yes, there will be frequent perfume giveaways for commenters)! Without further ado, let us kick the blog off with a profile of our three brand new extrait strength parfums and a fragrance giveaway! We will begin with La Forêt de Fontainebleau as it has garnered a lot of attention since we created it a few months ago. Forêt is a vintage style fragrance through and through. It began as a result of me lamenting the inferior quality of the reformulated blends of classics from Caron, particularly Bellodgia and Tabac Blond. Both of these fragrances have suffered major revisions due to severe IFRA restrictions on key ingredients such as oakmoss absolute and clove oil. I will not delve into the controversy surrounding these restrictions, suffice to say that I disagree strongly with these decisions and continue to use such treasured raw materials. International fragrance politics aside, Forêt provides starring roles for these two sumptuous ingredients. If you fell in love with the vintage formulae of beauties such as Tabac Blond, Forêt should satisfy your cravings. "La Forêt de Fontainebleau captures the excitement of nineteenth century vacationers and artists as they explore the forest of Fontainebleau with their cameras, paints, and picnic baskets at the ready. The familiar scents of forest foliage and crushed grass mingle with the new aromas of leather boots, rich Parisian perfumes, and painter’s palettes as the visitors wander about, eager to find the perfect view or the best shaded grove for an afternoon luncheon: a modern olfactory invasion of the tranquil woodland. A must-try for vintage perfume lovers. The oakmoss-heavy base of La Forêt de Fontainebleau contains our own all-natural interpretation of de Laire’s famous Mousse de Saxe accord: redolent of forest foliage, licorice, and leather. This dark base adds depth to the spicy and sharp heart notes of pepper, clove, and carnation." making an appointment with them to meet in the Milky Way afar." Prunier aims to capture the joy of a midnight tipple in a moonlit Chinese forest. Though a plum tree is not mentioned explicitly in Li Bai's poem, both the fruit and blossoms of this tree are of immense significance to the Chinese literary and scholarly traditions, and their rich scents fit right into the perfume's overarching concept. True to the theme of imbibing, the combination of plum and a rich white floral heart of tuberose and jasmine give the fragrance a distinctly boozy characteristic. However, the fragrance avoids the risk of veering into the territory of cloyingly sweet fruit liqueurs by balancing its sweet top and heart with a dry, incense base dominated by hydrocarboresine (a natural amber material created by a fractional distillation of cistus resin). Many modern fragrance enthusiasts (and even industry experts) still hold onto a number of misconceptions about nineteenth century perfumes. Mainly, that Victorian perfumes were fairly boring and delicate floral creations that lacked both creativity and dynamism in their composition. One sniff of mid-nineteenth century favorites such as Rondeletia or Extrait d'Ambre will quickly disabuse anyone of this notion. However, the perception of quaint floral bouquets still lingers and Extrait d'Osmanthus is our original attempt to reintroduce the merits of late nineteenth century style perfume composition to the modern nose. Extrait d'Osmanthus is an animalic Osmanthus soliflore built along the lines of a nineteenth century perfume. So what exactly is the structure of a nineteenth century perfume? Usually it consists of very few top notes, a large number of heart notes, and a substantial, but very neutral base consisting of mostly animal-derived ingredients. 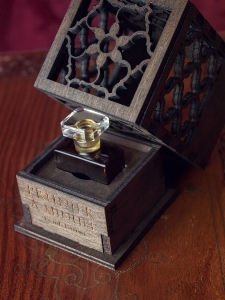 The base of a nineteenth century perfume rarely steals the show; its all about highlighting the heart of the fragrance. The top is generally small (except for in colognes) as perfume atomizers were not popular until the very end of the century, and a big top is designed to create an immediately appealing effect when an atomizer is sprayed into the air. The structure of most nineteenth century perfumes are also fairly linear, but not necessarily in a negative sense. Many perfumistas use the term "linear" to describe perfumes whose scent does not change very much as the perfume progresses: the opposite of dynamic perfumes that morph and evolve in interesting way as time passes. However, when talking about well-crafted Victorian perfumes, I mean linear in the sense of a controlled and precise evolution of the scent: a scent that moves smoothly from one part to the next, balancing all of the notes in perfect harmony. The result is a beautiful floral perfume with an unexpectedly musky undertone. The headspace of the autumn Osmanthus harvest. Comment at the end of this article to enter our giveaway for a sample of the fabulous Prunier à Minuit, along with the two other extraits. How to Enter the Drawing! To enter our sample set giveaway, simply comment on this post telling us which of the new scents you are most interested in and what country you are located in. This drawing is limited to participants in the United States and Canada. We are hoping to open up future drawings to a more international audience, so if you are not residing in the US or Canada, stay tuned, you will be included soon! The drawing closes on October 22nd, so be sure to post your comments before then.